An epic book that unravels the mysteries behind the life of a true musical genius. Legendarily reticent, perverse and misleading, Prince is one of the few remaining 80s superstars who still, perhaps, remains unexplained. Now a firm fixture in the pop canon, where such classics as ‘Purple Rain’, ‘Sign o’ the Times’ and ‘Parade’ regularly feature in Best Ever Album polls, Prince is still, as he ever was, an enigma. His live performances are legendary (21 Nights at the O2 in 2007) and while recent releases have been modestly successful at best, his influence on urban music, and R’n’B in particular, has never been more evident. The Minneapolis Sound can now be heard everywhere. 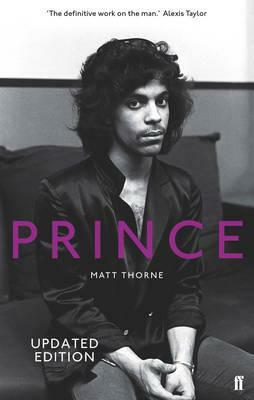 Matt Thorne’s Prince, through years of research and interviews with ex-Revolution members such as Wendy and Lisa, is an account of a pop maverick whose experiments with rock, funk, techno and jazz revolutionised pop. 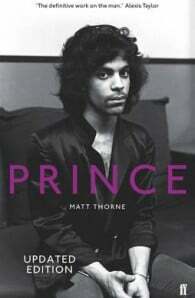 With reference to every song, released and unreleased, over 35 years of recording, Prince will stand for years to come as the go-to book on the Great Man. Matt Thorne has published five adult novels to widespread critical acclaim, co-edited the anthology All Hail the New Puritans, and is a regular reviewer for the Independent on Sunday.